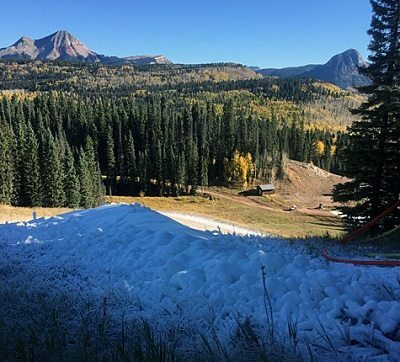 Purgatory Begins Snowmaking – earliest in resort history! With the recent round of cold weather, our Slopes Manager, Josh Hamill launched snowmaking operations at Purgatory on Oct. 6 — the earliest snowmaking start in the history of the resort. We ran just over 20 snow guns and carefully piled our machine made snow into a handful of shaded spots on the mountain where it will hold until we’re ready to start pushing snow around with snowcats to build trails. We will continue snowmaking operations whenever temperatures permit until Mother Nature takes over. Trail work on the backside of Purgatory continues. The re-grading of the Legends Bypass was completed as of Wednesday, Oct. 12. The earth moving machinery that finished up the Legends Bypass trail is being moved over to excavate the footings for the new T-3 surface lifts. A new trail is under construction on the backside with about a quarter of the slope length already cleared. We expect the clearing of this slope to continue into November as long as the weather cooperates. 35 days and counting until opening day, Nov. 19. See you on the mountain!